Take “Casablanca,” remove all the fun parts, and set it in the present day. It’s not such an odd idea. In Christian Petzold’s “Transit,” it feels eerily natural, and that’s both horrifying and fascinating. “Transit” stars Franz Rogowski (“Happy End”) as Georg, a man asked to deliver mail to a writer in the midst of a contemporary fascist regime, during a violent purge of immigrants called “Spring Cleaning.” But when Georg arrives with the mail, he discovers the writer, Weidel, is already dead. He killed himself after, as his letters suggest, the rejection of his latest novel and the rejection of his estranged wife. Georg is then asked to help another, wounded man travel to Marseilles, where that man can reunite with his family and leave the country, but the perilous journey leaves him dead too. With no plan, no friends, and no hope, Georg tries to turn in Weidel’s final manuscript to the Mexican consulate for a finder’s fee, only to get mistaken for the author himself and to receive his exit visas. All Georg needs are, in classic “Casablanca” fashion, letters of transit that will allow him to visit each port where the ship will dock en route to Mexico. The bureaucracy takes time, and in that time Georg worms his way into the lives of Weidel’s wife Marie (Paula Beer, “Frantz”) — who has heard her husband is in town, and assumes he’s alive — and the son of the dead man who accompanied Georg to Marseilles. Everyone Georg meets is in transition. Everyone has a story to tell. Everyone is going to die if they can’t get out of town. But only Georg has tickets, and he has only two of them. “Transit” is based on a novel written in 1944 by Anna Seghers, inspired on her own experiences fleeing the Nazi occupation of France. 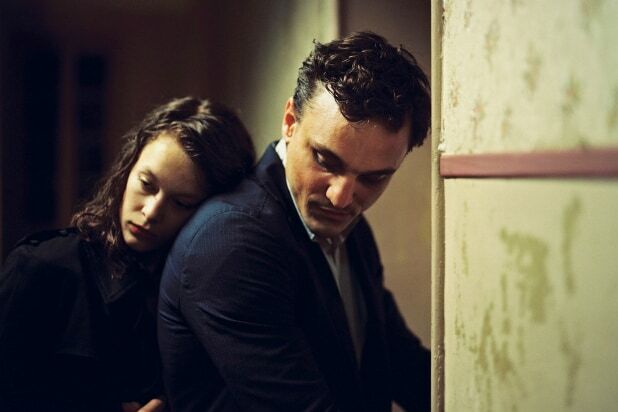 Writer-director Christian Petzold (“Phoenix”) has transposed her novel to the present day, in the midst of a non-specific fascist uprising in Europe. The political messaging inherent to such a creative decision is obvious but effective, keeping Seghers’ work alive as a rich and relevant cautionary tale. Devoid of pretty speeches and old-fashioned melodrama, “Transit” is a hellish little misery of a movie. That’s a compliment. Weidel’s last, unpublished manuscript describes hell as perpetually waiting for a bureaucracy to notice you, and Petzold’s film sensitively dramatizes the frustrations and anxieties that infect the film’s characters. Everyone who successfully flees tyranny leaves somebody behind. Nobody could possibly succeed in a story like “Transit” without living the rest of their lives in shame. So they take pride in their little moments, short dinners, and games in the street. And every single one of those momentary diversions only underscores just how dire their situation is. “Transit” is probably the only movie based on a World War II novel to include a pointed reference to the plight of the zombies in George A. Romero’s “Dawn of the Dead,” who keep going to the shopping mall even though they’re already deceased. Aside from a few modern references, and the make and model of the cars, you’d be forgiven for thinking “Transit” was still a period piece. The plot makes little use of modern technology, and the surroundings are all empty of modern conveniences and distractions. The production design by Kade Bruger (“Phoenix”) and set decoration by Aurelie Combe, working in tandem with natural, classical lighting and framing by cinematographer Hans Fromm (“Phoenix”), depict a Europe that has physically regressed along with its politics. The characters are alive today, but they live in the past, and the simple fact that Seghers’ story about people trapped on the edge of a world teetering into institutionalized evil feels like it could — with a few minor adjustments — have been written right now would have been frightening enough. But the potent and complicated performances by Rogowski and Beer make “Transit” feel less like an exercise and more like an invaluable text, a universal depiction of cyclical misery in which are all either mired or blindly about to enter. “Transit” lacks the pulpy punch that Michael Curtiz gave to “Casablanca,” so it’s unlikely to “please” any crowd. But it always feels seductively dangerous, as though making it might have been an act of political defiance, and watching it could, with only a few horrible changes to our current political climate, be against the law. The film’s empathy for the unwanted, its frustration at the system, and its uncompromising depiction of people trying to do the right thing when fate clearly has other plans, registers with real power. 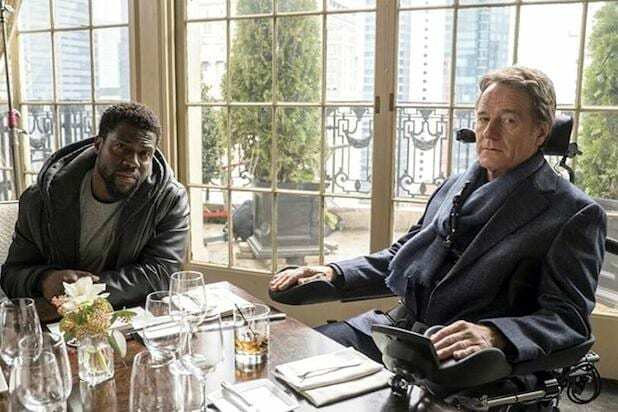 Opening this weekend is "The Upside," an American remake of "The Intouchables," a film that made so much money in France that it became a cultural event. After earning $166 million in France, the country's second-highest-grossing film ever, and over $426 million worldwide, an American remake of the film was inevitable. But surprisingly, box office hits abroad don't always translate when remade with American actors, and the ones that do rarely resemble their original inspiration. Here are the highest-grossing American remakes of foreign films (all domestic box office figures via Box Office Mojo). The romance didn't translate overseas because while audiences were hoping for "The Tourist" to be a steamy thriller from Angelina Jolie and Johnny Depp -- something the original managed with Sophie Marceau and Yvan Attal -- critics dismissed it. But that wasn't the case with audiences and the Golden Globes, who nominated it for Best Picture - Comedy or Musical. This much-loved Hugh Grant and Julianne Moore rom-com about pregnancy started as a French romantic comedy called "Neuf mois," but it was the remake that took off in America and abroad, grossing $138 million worldwide. The snappy French comedy "Le Diner de Cons," or "The Dinner Game," made over $4 million at the domestic box office after releasing in France back in 1998, spawning this less-critically successful remake from Jay Roach starring Paul Rudd and Steve Carell. Both "Antarctica" and "Eight Below" were big box office hits. How could a survival story about eight huskies not be? But while "Eight Below" is a Disney-fied and whitewashed version of the story, the Japanese film hews closer to a real-life ill-fated rescue mission from the '50s. "Antarctica" also held the box office record in Japan until the release of "Princess Mononoke" in 1997. Cameron Crowe directed Tom Cruise in the American remake of Alejandro Amenabar's "Abre Los Ojos," about a handsome and vain man who suffers an accident that disfigures his face. Crowe's version follows Amenabar's closely but makes a significant change to the ending that polarized some critics and audiences. While technically an American version of Stieg Larsson's book, the success of David Fincher's "The Girl With the Dragon Tattoo" owes a lot to the overseas success of the Swedish adaptation of the book. The Swedish version grossed over $10 million in America and over $100 million worldwide. And the film's star, Noomi Rapace, set the stage for screen versions of Lisbeth Salander, further using it as a launching pad for her own English-language acting career. Mark Wahlberg might not be Michael Caine, but F. Gary Gray's retro caper of the classic British heist movie was a box office hit and helped put Mini Coopers back on the map stateside. "The Grudge," like "The Ring," was part of a wave of Japanese horror remakes from the early 2000s and also spawned several other American horror sequels. Mike Nichols' "The Birdcage" isn't just a remake of a foreign film, it's also an adaptation of a long-running French play. Both film and play are titled "La Cage aux Folles," and the French film adaptation was nominated for three Oscars following its release in 1978. The American version of "The Ring" remains the highest-grossing horror remake of all time, and it was so wildly successful that it spawned a whirl of other American remakes of Japanese horror films, including "The Grudge," "Pulse," "The Eye," "Shutters," "Mirror" and more, all within a few years of each other. Martin Scorsese's "The Departed" is so intrinsically tied to Boston cops and gangsters that it's hard to remember that the film's twisty story of moles and double crossing originated in Hong Kong as "Infernal Affairs," which itself spawned several sequels abroad. And while the film's critical acclaim in Japan was impressive, it was Scorsese's film that won the Oscar for Best Picture. Roland Emmerich's "Godzilla" starring Matthew Broderick wasn't a hit with critics, but it did stomp all over the box office in 1998, becoming the 9th-highest-grossing film of the year. The French "La Totale!" is firmly a comedy and performed modestly at the French box office, but James Cameron made it his own when he cast Arnold Schwarzenegger in his tongue-in-cheek action blockbuster. Made on a mid-size budget and starring the most '80s cast of Tom Selleck, Steve Guttenberg and Ted Danson as three bachelors watching over a baby, "3 Men and a Baby" was a surprise comedy hit as the top grossing movie of 1987. But its French predecessor was likewise a success, earning an Oscar nomination for Best Foreign Language film in 1986. "Godzilla" has had so many remakes and sequels over the years, but Gareth Edwards' film gets closer to the melancholy of Ishiro Honda's original monster movie than ever before. Do the Oscars Have an Asia Problem in the Foreign Language Film Race? Did ‘Team America: World Police’ Inspire the Trump Administration’s America-First Foreign Policy?